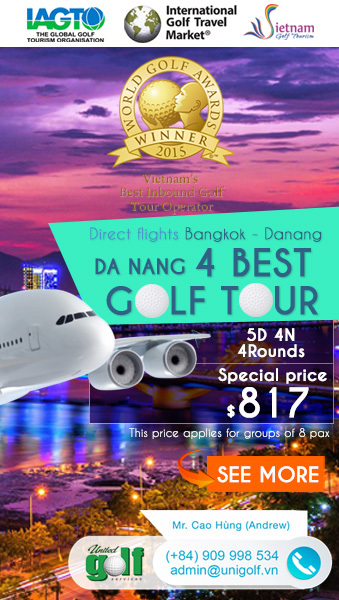 With UniGolf’s 4 days 3 nights tour, you will discover the conquering journey with the 4 amazing golf courses: Da Lat Palace Golf Club, Sea Links Golf and Country Club, Sacom – Tuyen Lam Golf Club, Dong Nai Golf Resort. 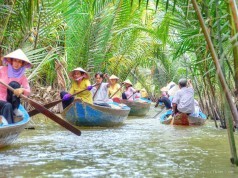 Located on an area of 260 hectares where is 55 km away from Ho Chi Minh City. 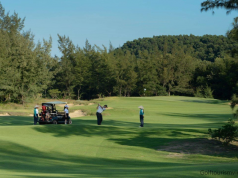 Dong Nai Golf Resort is the first 27-hole golf course in Vietnam, the course has three unique nine-hole layouts with each nine measuring more than 3,500 yards in length from the tips. There’s lots of variety when you play here as you can combine two different nines to create the 18-hole format for a great par-72 round. Golfers of every skill level can enjoy a great day on 27 holes for any tourney — from multi-day tournaments to a 9-hole Scramble. Pleasurable-yet-challenging rounds of golf, fine food and drinks afterwards makes Dong Nai Golf Resort the perfect outing destination. One special thing of Dong Nai Golf Resort is that its geographical position is next to a 1,000 hectares natural lake. The water level of the lake changes considerably over the course of a year, creates a wonderful space for the golf course. Sea Links Golf & Country Club that is incorporated in the Sea Links complex, is the first links golf course in Vietnam. The 18-hole, par 72 golf course situated on a cliff and sandy dunes at the elevation of 60 meters above sea level that offers amazing views of the ocean below. The course is regarded as the most challenge sand dunes golf course in Asia of which difficulties belongs: rolling fairways, bunkers and water holes are large ingenious layout, many trees, bushes and sunshine and sea breezes. Golfers come here with the desires not only to conquer a challenge golf course but also to enjoy the nature, sky, sea and the hospitableness of the people here. Especially, you can also experience the noble subject spectacular sea front or shimmering lights by night. is surrounded by mountains and stretches across the valley below. Sacom Tuyen Lam Golf Club is designed to be an excellent place for summer escape or relaxing vacation. for Emperor Bao Dai, Vietnam’s last Emperor. The course is located in the center of Da Lat city rising above the Xuan Huong Lake, which is considered as the heart of Da Lat. Da Lat Palace Golf Club is not only the oldest golf course in Vietnam, but also one of the most beautiful golf courses in Vietnam. Contrary to the other courses in VN, with its year-round cool weather, Dalat Palace Golf Club is the only golf course in Southeast Asia with Bent grass tees, fairways and greens. The course measures 7,009 yards, par 72 and provides an enjoyable challenge for players of all skill levels. After experiencing the above golf courses, you will have a wonderful time resting at: Sea Links Beach Hotel, Dalat Hotel Du Parc. Sea Links Beach Hotel is a 5-star international standard hotel, located in Sea Links City resort, at Mui Ne Bay, close to Phan Thiet City, consists of luxury villas, luxury apartments resort, an 18 holes golf course and a 5-star international standard hotel. This is not only the largest hotel with 188 rooms but also the only hotel which has a panoramic view of the entire Mui Ne coast. With its special unique beauty, no one can deny at least one time staying in these premium rooms. Duparc Hotel Dalat is located just 10 minutes walking from Da Lat Center. The building was first built in 1932 and renovated in 1995 but still retained its original French colonial architecture. Dalat Du Parc Hotel has total 144 rooms with comfortable furniture, large bathroom, satellite TV. This hotel also has horse riding service, tennis and large beautiful garden to go jogging in the morning or just simply sit and relax with your friends. Viet restaurant is delicious and reliable on the terrace, which is also the Le de La Poste coffee lounge with barbecues serving daily. Day 1: Car pick you up from the Airport to Dong Nai Golf Resort to play one golf round, and then depart to Mui Ne. Check in at Sea Links Phan Thiet, freely relax. Day 2: After breakfast, golf at Sea Links Golf and Country Club, then depart to Da Lat. Checkin at Du Parc Hotel Da Lat, freely relax. 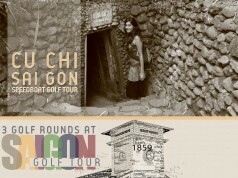 Day 3: After breakfast at hotel, car takes you to Sacom – Tuyen Lam Golf Club to play one golf round. Then go back to the hotel for resting and enjoy the nightlife in Da Lat. Day 4: After breakfast at hotel, car takes you to Da Lat Palace Golf Club to play one golf round, then go back to HCMC, the tour finishes. 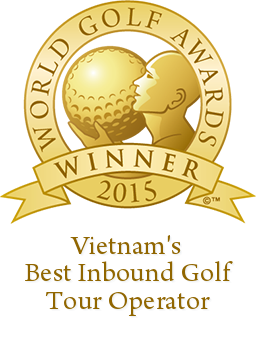 Keyword: da lat palace golf, sea links golf, sacom tuyen lam golf, dong nai golf.